Germany's former Chancellor Gerhard Schroeder has hugged Russian President Vladimir Putin in St Petersburg, despite the imposition of more Western sanctions on Russia. Mr Schroeder has long had close ties to Mr Putin and runs a pipeline venture bringing Russian gas to Germany. Their embrace was photographed as Mr Schroeder celebrated his 70th birthday. He held his Russian party as Nato states accused Russia of helping pro-Putin militias in eastern Ukraine. Russia's state monopoly Gazprom pumps gas to Germany via the Nordstream pipeline under the Baltic Sea, and Gazprom chief executive Alexei Miller was reportedly among Mr Schroeder's guests at the Yusupov Palace in St Petersburg. Three German officers are among seven military observers from the Organization for Security and Co-operation in Europe (OSCE) currently held captive by pro-Russian rebels in eastern Ukraine. The German government has demanded their release. The OSCE sent in unarmed observers after the rebels seized Ukrainian official buildings. 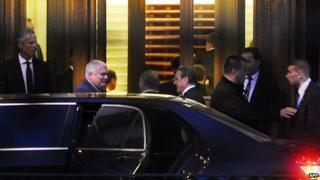 German media commentators criticised Mr Schroeder on Tuesday for his closeness to Mr Putin. The Russian leader speaks fluent German, having served as a KGB secret service officer in communist East Germany during the Cold War. Mr Schroeder was chancellor from 1998 to 2005. He used to lead the centre-left Social Democrats (SPD), who are now in coalition with Chancellor Angela Merkel's Christian Democrats (CDU). Roland Nelles of Spiegel Online said the former chancellor "apparently forgets that one must still act responsibly for one's country as a former government leader". "It would help if the ex-chancellor could use his influence to bring some sense to his friend Putin. Perhaps he is doing that too, but unfortunately you don't get any sense of that whatsoever. Pity," he wrote. In Frankfurter Allgemeine Zeitung another commentator, Thomas Holl, said "the pictures of a laughing Schroeder, being hugged and cuddled by his friend Vladimir in the former tsarist palace, while German army soldiers are held hostage by fanatical Putin admirers, look macabre". A senior German government official quoted by Reuters news agency said Mr Schroeder "does not represent the German government" and he "left active politics some time ago".